With increasing amount of work load, all of us face shortage of time for other important activities. And one such thing is, drying clothes after washing. It is utterly important to dry clothes after washing them as moist clothes produce smell. Also they are good platform for bacterial growth. So here we are to with our 9 best electric clothes dryer to buy in 2019. Tradition way of drying clothes is by hanging them on outdoor clothes line. Therefore, sunlight evaporates moisture from the clothes as well as UV rays prevents growth of bacteria and molds. But with increasing population, shortage of time and small space of living, one major problem is to dry clothes outside. And in order to overcome these problems, different types of clothes dryer are available. Sometimes its not just about space and time. Environmental factors like very less sunshine during day, high humidity, rainy season, etc. are responsible for slow drying of clothes. In such cases, a best energy efficient clothes dryer saves time and energy. So what are you waiting for? 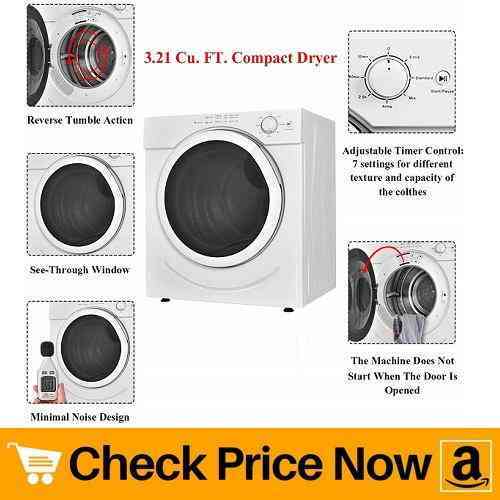 Our reviews contains best clothes dryer for small apartments, portable clothes dryer if you change place frequently and much more. All your answers are few scrolls away. 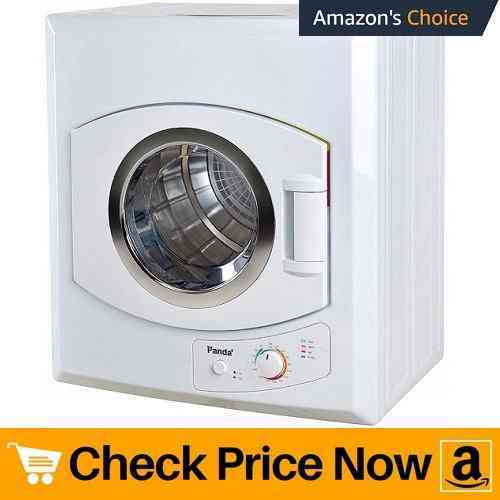 Here is the list of good electric clothes dryer (winner products) after our review. 2.1 1. Which is the best electric clothes dryer to buy? 2.2 2. What are the clothes dryer electrical requirements? 2.3 3. How does an electric clothes dryer work? 2.4 4. Why do we need such dryers? 2.5 5. Why To Choose electric clothes dryer Over Gas? First on our list we have kenmore electric clothes dryer. It have a capacity of 7.0 cu. ft, large enough to accept any size of load. Let us focus on its features which makes it one of the best clothes dryer to buy in 2019. 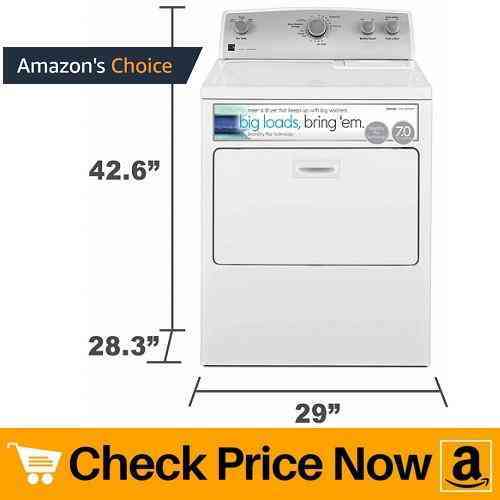 The most attractive thing about this item is, Kenmore 65132 includes room of choice delivery, un-boxing, product hookup. Also you get a free option haul-away at checkout. So ultimately, you get free installation along with additional parts. Besides that, wrinkle guard technology prevents set-in wrinkles for up to 150 minutes after the dry cycle. You can choose this option if your load contains very delicate fabric. In order to control drying temperature and moisture, auto dry uses an integrated thermostat. This in turn, prevents overheating of the device as well as ensures proper heat flow. Apart from that, smartdry plus technology uses 2 moisture and 1 temperature sensor to adjust the dry cycle. Hence, protects the clothes from shrinking. The only thing about this device is, it does not contain a viewing window. Therefore, you cannot monitor the drying process which in our perspective is not a big issue. In consists of a drop-down door which makes sorting of laundry in and out easier. Further, Kenmore dryer can be also used as quick resting spot for the clothes basket. 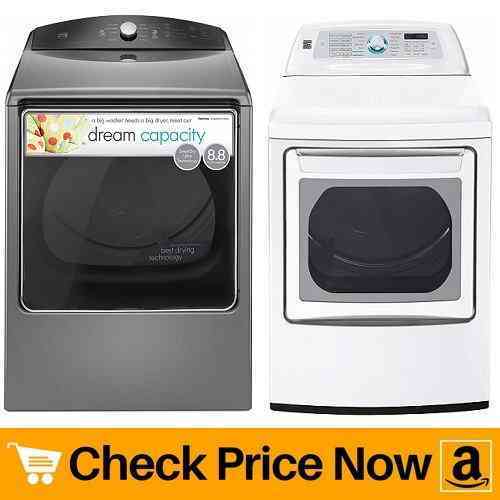 This full-size electric clothes dryer is ideal for family of 4-6 members. As the item weights 109 pounds, it is difficult to move and not portable. Thus, which makes this model perfect for large spaces. Next on our list we have this small electric clothes dryer. It is perfect for those who live in small apartment, dorms or condos. This compact size dryer does not require much space. Plus light weight of this model makes it easy to shift it from one place to another. Also you can mount the unit on wall due to its light weight. Drum capacity of 8.8 lbs is sufficient enough for 2-3 persons. Panda PAN40SF runs beautifully and makes normal dryer sound. In addition, it comes with a removable lint filter. In order to achieve great smelling clothes every time, make sure to clean the lint after every use. This 110v electric clothes dryer consumes less electricity. Though, it is power saving, it requires more time to dry clothes as compared to 220v or 240v dryer. On positive note, a 110v plug is easily available in small apartments and dorms. Therefore, you can simply plug the machine and dry your clothes. Speaking about the construction, Panda clothes dryer (PAN40SF) model is strong and durable. It consists of stainless steel drum which effectively dries your clothes and lasts long for years. Plus the transparent lid allows you to monitor your clothes when inside the tumble dryer. 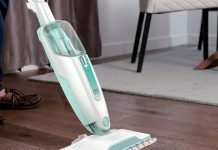 All the above features made us include it in our best clothes dryer to buy in 2019 list. Small size and light weight of this model is best for small living spaces like apartments and dorms. Moving ahead, we have this mini electric clothes dryer. Tons of positive response from multiple customers made us include this product in our best electric clothes dryer list. Let us focus on its features and working capacity. First of all, the laundry alternative spin dryer is portable which means you can shift this device easily from one place to another. Secondly, it is vent-less portable electric clothes dryer. All you need to do is, find a good location, plug in and start the machine. Its 1800 rpm spin speed removes 90% of water under 3 minutes. To turn on the machine, simply plug and close the lid. And if you wish to stop it, gently pull the latch and the lid will open automatically. For safety, the device consists of motor locking bar at the end. In order to make the motor operate, you must remove that bar. In our opinion, it would be best if the company included on and off button switch. It simply would make the product more safe and convenient to use. Overall, we love all other features. This portable unit is ideal for small apartments. Generally small dryers do not come with option to set temperature and you have to compromise. And sometimes, too much heat inside the drum damages delicate clothes by shrinking them. But here’s a descent small electric clothes dryer with 5 temperature control options. If you lack floor space, there is an option to mount the unit on wall. Also the wall mounting kit comes along with the purchase of the product. 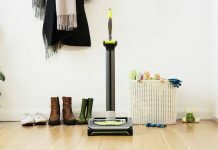 You can mount Magic Chef MCSDRY1S all by yourself or ask expert for help. Overall, the construction of the inner and outer body is strong. Durable stainless steel inner drum can hold good size of load. Plus the PTC heating element heats inner body fast and passes heat evenly. One main advantage of this model is,it comes with adjustable time control option. Also you can choose setting from air dry, cool, warm and hot. Viewing window at front allows you to watch clothes while inside the drum. In addition, this Magic chef dryer also contains lint and air intake filter. This in turn, effectively dries laundry along with filtering out dirt and bad smell. Small size of this unit makes it ideal for rv and small to medium size families. Let us face this, we all want a product which gives best results and consumes less electricity. But what if we say, that this 110v electric clothes dryer is portable, space saving and more importantly, energy efficient. Sounds like a joke right? But actually this is true. Let us throw some light on its features. Sturdy stainless steel drum gently deals with your laundry as well as remains intact for years. On the other side, the outer body have a mirror finish which makes the whole unit look classy and attractive. The motor runs quietly and water pours out from drain spout. A safety lock is present on the side of the lid in order to open it safely. As Panda PANSP22 does not come with on/off switch, you need to move a small handle like part to start the machine. And to turn it off, simply move the handle back to its original place. So conclusively, it is more a kind of spinner than a dryer with 3200 rpm spin speed. 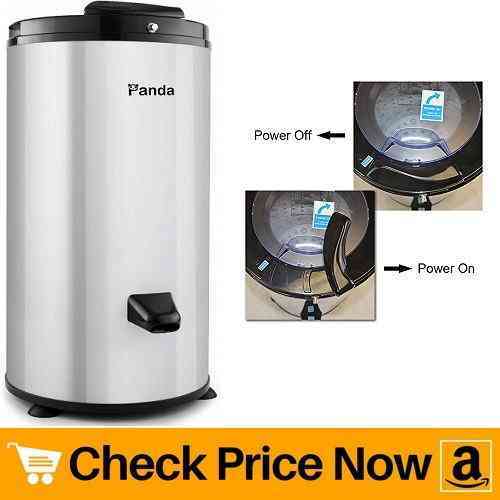 Panda PANSP22 dryer does not dry your laundry completely, rather it gets the work done by removing 90% of moisture from clothes. This portable electric clothes dryer is perfect for apartments, dorms, condos, RV, boats, etc. 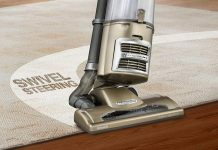 A full size drying-power in a portable machine is just what people with small space looks for. So here we present you ivation portable and compact electric clothes dryer. What makes this device different from others is its 7 dry settings. Using appropriate option, you can do all your laundry perfectly. Easy start and pause button at the end of machine is convenient to use. Apart from that, you can manually adjust the timer or type of drying you want. 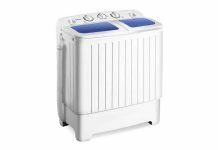 Rapid drying power of 1500 watts effectively deals with your laundry. Most interesting thing about this product is, it is built using high quality materials. Both inner and outer construction is strong and reliable. Moreover, Ivation IVADRYER13W generates less noise as compared with other portable models of same range. Semi-transparent viewing lid allows you to watch your clothes when inside the drum. Apart from that, it includes a lint filter. In order to keep the performance of the dryer intact, clean the lint filter after every use. Compact size easily fits in apartments, condos, town-homes, dorms and RV’s. A powerful kenmore electric clothes dryer effectively dries all your laundry without damaging any fabrics. The company offers room of choice delivery, un-boxing, item hook-up and free optional haul-away at checkout. Moreover, the item includes the parts necessary for hook-up. Kenmore dryer 68133 features ‘smartdry ultra technology’ which automatically detects moisture level and adjusts cycle time and heat. In addition, express-dry option gets small load dry in under 30 minutes. Thus, great for people who hate waiting for long hours. 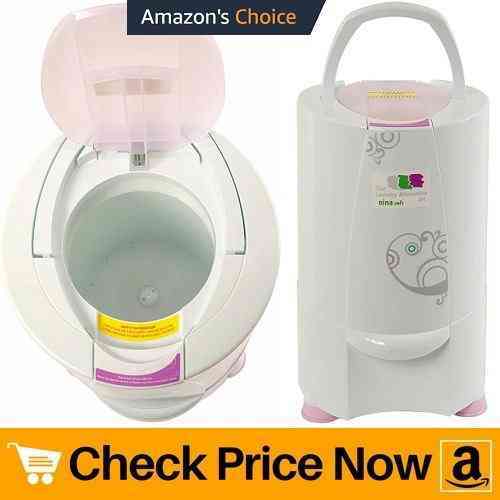 Also this is great option for people having baby as babies require a lot of cloth change frequently. You can select wrinkle-guard option to avoid getting wrinkles on fabrics. Not just this option prevents your clothes from getting wrinkles but it also ensures that the fabric doesn’t shrink. 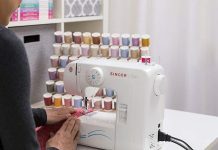 Therefore, perfect for drying delicate fabrics. The large 8.8 cubic feet capacity can handle heavy load with ease. Besides that, sanitize cycle kills household germs and bacteria. Thus, all you get is, dry and germ-free soft toys, blankets and fabrics. This large electric clothes dryer is suitable for medium to large size apartments or homes. Further, this unit have a huge load capacity which means it is not portable. So, it is best to choose relatively large space to place this dryer. Next on our best electric clothes dryer list we have this small powerful unit. With load capacity of 8.8 lbs, it is ideal for RV, dorms and small apartments. Let us us know more about what makes this small unit so special. Firstly, it weights approximately 50 pounds which means it is easy to shift the whole device by yourself. Not just that, light weight of the product makes it easy to mount it on wall. And mounting kit comes free with the purchase of the dryer. Thus, saves floor space. This 110v electric clothes dryer is energy efficient. Though, it is not powerful as big units, but it effectively dries clothes without any damage. The only thing is, it takes a little long time as compared with other big models. In conclusion, this is a compact, portable and powerful machine with see-through window. Plus the lint filter is easy to remove and clean. And lastly, it works pretty quietly. Dorms, condos, RV’s and small living spaces. Last on our review list we have a compact electric clothes dryer. 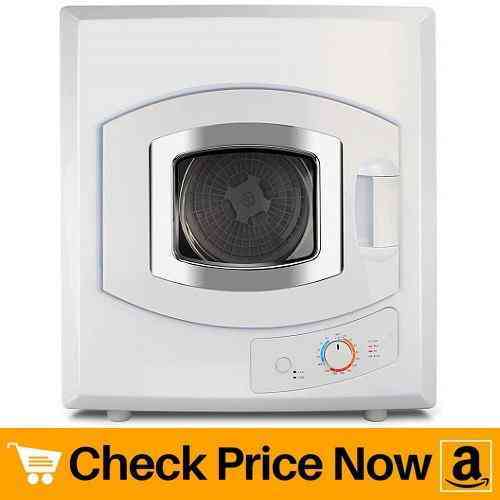 Being low on cost and built up using high quality materials made us include this product in our 9 best electric clothes dryer review. Its reversible tumble action helps to dry your laundry fast. Further, it also ensures that heat evenly passes through all angles. This not only makes your clothes dry fast but also saves a lot of energy. As the product weights less you can easily shift it. Also, the small size of the unit easily fits in small space. And similar to majority of the models, this one also have a see-through window to monitor the drying process. Plus it comes along with a wall mounting kit to easily mount the unit on wall. Thus, saving floor space. Suitable for limited space like dorms, condos, motor homes, apartments, RV’s, etc. So finally, here we end our reviews of 9 best clothes dryer to buy in 2019. All our reviews are unbiased and maximum efforts are made in order to get you perfect dryer. In our below section, buyers guide will help you understand general things about a clothes dryer. 1. 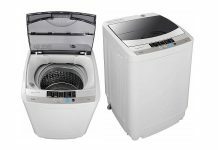 Which is the best electric clothes dryer to buy? Okay, we read the review, still which one is the best according to homestuffpro? We are classifying it into two main categories, for small space and for large living space. For small areas: Placing stuff in small areas is really a tough job. So in our opinion, select a dryer which is portable, small in size and have an option of wall mounting. Apart from keeping all these things in mind, you should also focus on the performance and load capacity. And therefore, we think panda 2.65 cu. 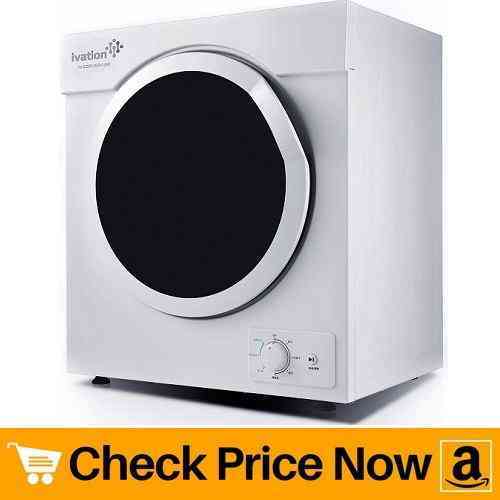 ft. compact laundry dryer is ideal for small living space. 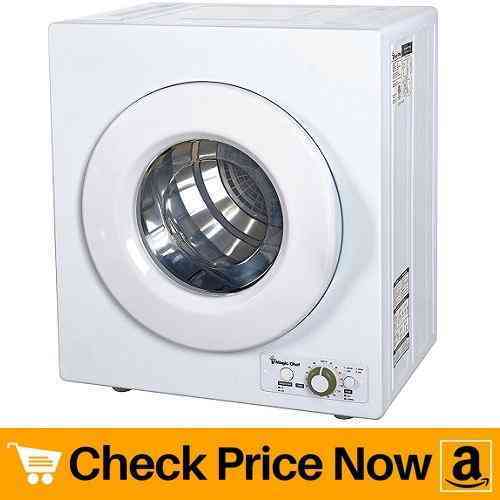 For large areas:If you’re looking for a good electric clothes dryer and have enough of area then always check the performance of the machine first. As you have space to fit the unit easily, portability and compact size should be your second priority. After studying all the products thoroughly, in our point of view, Kenmore 65132 7.0 cu. ft. delivers best performance. Keep coming back to us to read more unbiased reviews about home appliances. 2. What are the clothes dryer electrical requirements? Electrical requirements differs from model to model. Basically, it depends on the size and type of unit. In order to help you get a clear idea of the same, we have the following points. Plug Size: Normally, small and portable units requires 3 prong standard house plug. This kind of plug is easily available in any living space. But in the case of large units, you may need to purchase appropriate circuit or wire separately. Circuit Breaker: A unit which runs on 110/120 volts should be protected by a 15 or 20 amp circuit breaker. And machine which requires 240 volts must be guarded with a 30 amp circuit breaker. If you don’t want to install a circuit breaker, you can make use of dual element time-delay fuse. 3. How does an electric clothes dryer work? Working of an electric clothes dryer is very simple. Go through the below points to get clear idea about how the device works. The drum holds the laundry having moisture. When you switch on the device, a heating element heats the the air and this warm air removes moisture from your clothes. Side by side, the air containing moisture or the steam passes out through vent. Many mini electric clothes dryer are vent-less, this is because they dry clothes using cool air. And thus, do not require air vent. 4. Why do we need such dryers? In the very first section, we have mentioned why do we need an electric clothes dryer. Briefly, lack of time, environmental factors, fast drying, lack of space for drying clothes, etc. are main reasons to have a clothes dryer. 5. Why To Choose electric clothes dryer Over Gas? This question is common for every new buyer. Even people owing an electric clothes dryer asks us which one is the best. So here we have listed some points and hopefully it will solve your gas vs electric clothes dryer doubt. First of all, gas dryers are expensive then electric ones. Usually, they cost $50 to $100 dollars more. Secondly, you need to have a gas connection line where you want to place the unit. Even if you have a gas line, you will need a good electrician to install the product. Whereas, in case of electric dryer, all you need to do is plug the wire into appropriate socket. Running cost of gas dryer is more than that of electric one. A same size of load will cost less using electric dryer and will almost double in the case of gas models.